The facts and information regarding the Ancient Egyptian culture details the way of life shared by the members of a society and the their social relationships, their institutions and organizations. What was the social structure in Ancient Egypt? What jobs were available to the Ancient Egyptians? What social status could be achieved? The Ancient Egyptians lived in a well ordered culture and society which was administered by law enforcers, judges and courts. All classes of society paid taxes which in turn paid for the government and army. 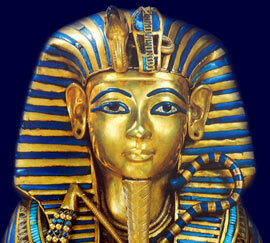 The Pyramid of Power started with the Pharaoh who was the absolute ruler of Ancient Egypt. The Social ranks in Ancient Egypt were divided somewhat sharply. There was a large class of nobles, who were mostly great landed proprietors living on their estates, and having under them a vast body of dependents, servants, labourers and artizans. The Vizier was the most important court official. There was also a numerous official class, partly employed at the court, partly holding government posts throughout the country, which regarded itself as highly dignified, and looked down on the people. The Priests and Priestesses looked after the temples and conducted the religious ceremonies. Taxes were paid directly to the temples for their upkeep. There was a literary class, which was eminently respectable, and which viewed with contempt those who were engaged in trade or handicrafts. Commands in the army seem to have been among the prizes which from time to time fell to the lot of ordinary people. Below the major classes, and removed from them by a long interval, was the mass of the population, "the multitude", as the Egyptians called them. These persons were engaged in manual labour of different kinds. The greater number were employed on the farms of the nobles, in the cultivation of the soil or in the rearing of cattle. A portion were boatmen, fishermen, or fowlers. Others pursued the various known handicrafts. They were weavers, workers in metal, stone-cutters, masons, potters, carpenters, upholsterers, tailors, shoe-makers, glass-blowers, boat-builders, wig-makers, and embalmers. There were also among them painters and sculptors. But all these employments were regarded as unworthy of any one who wished to be thought respectable. However, the line of demarcation, as described above, might be crossed and people could be promoted to different jobs. Men frequently brought up their sons to their own trade or profession, as they do in all countries, but they were not obliged to do so, there was absolutely no compulsion in the matter. The "public-schools" of Egypt were open to all of the population, and the son of the artizan sat on the same bench with the son of the noble, enjoyed the same education, and had an equal opportunity of distinguishing himself. If he showed sufficient promise, he was recommended to adopt the literary life; and the literary life was the sure passport to State employment. State employment once entered upon, merit secured advancement; and thus there was, in fact, no obstacle to prevent the son of a labouring man from rising to the very highest positions in the administration of the empire. Successful ministers were usually rewarded by large grants of land from the royal domain; and it follows that a clever youth of the labouring class might by good conduct and ability make his way even into the ranks of the landed aristocracy. The condition of the labouring class was, generally speaking, a hard and sad one. The kings were entitled to employ as many of their subjects as they pleased in forced labours, and monarchs often sacrificed to their inordinate vanity the lives and happiness of thousands. Private employers of labour were frequently cruel and exacting; their overseers used the stick, and it was not easy for those who suffered to obtain any redress. Moreover, taxation was heavy, and inability to satisfy the collector subjected the defaulter to the courts.